Coco A: 2BR Vacation Rental on the Wailua River w/ Private Tropical Backyard, Grill, hammock etc. 600 square feet of luxury—for small families or a couple who want more space. 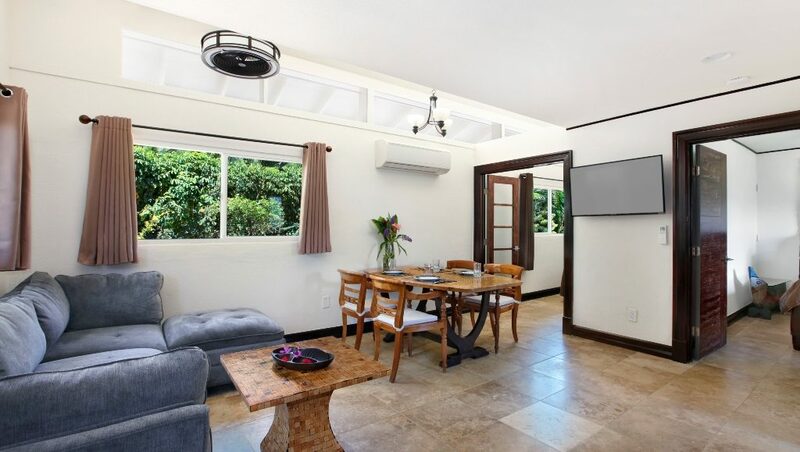 For easy island living, look no further than Coco A, a two-bedroom vacation rental on Kauai’s Coconut Coast. Situated just one block from the beach on the banks of the Wailua River, this is the Kauai paradise you dream of on chilly winter days. Our sun-drenched cottage is ideally suited for couples or a small family, with one queen-size bed and a 2nd bedroom with a full-size bed. Get ready for the day in a guest bathroom with walk-in shower, and come together in an open living area with sofa and flat-screen TV. Cook at home in a full kitchen with convection oven and gas range, and savor family meals at the dining table. You could spend an entire vacation relaxing at home in the fresh, island-inspired interiors. But with a tropical oasis in your own private yard, you may never want to leave your spot in the gently swaying hammock. and a one-time cleaning fee of $180 plus a tax of 14.962% . Each reservation has access to the entire unit exclusively. Full payment comes due at time of booking. Payment may be made by e-check or check. Credit Card payments will incur a 3% charge. It’s difficult to find such a large vacation rental at such a reasonable price. Reserve your dates today!